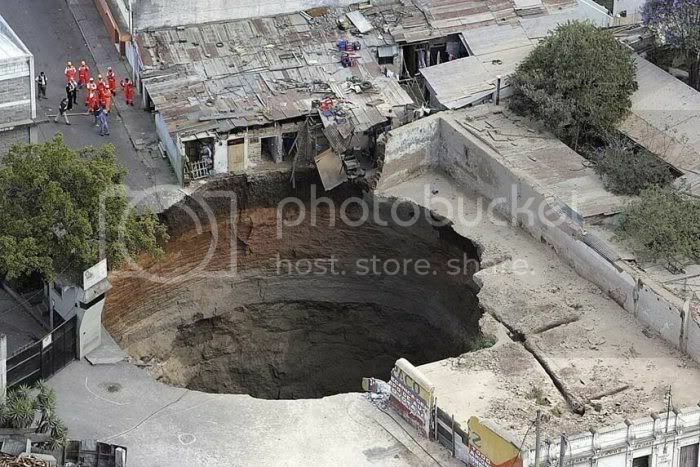 Agatha storm that struck the City of Guatemala, a large hole (sinkhole) appeared in the middle of the city resulted in one fatality and several injured. Launched the Daily Mail, Tuesday (1 / 6) mentioned a large hole has a depth of 200 feet (60 meters) where a three-story building also fell into the hole. This large hole appeared in the middle of a huge storm hit the city of Guatemala landslides that followed the current death toll reached 146 people. Tropical storms that occurred on Sunday and caused massive floods and landslides in Guatemala, Honduras and El Salvador. Guatemala became the country most severely affected.